On all open days Artipelag operates a bus between Vasagatan in Stockholm and Artipelag. 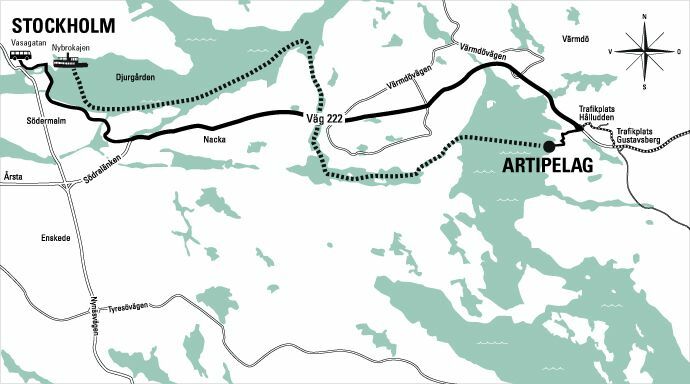 The trip to Artipelag is free of charge and the trip back costs SEK 50. From Slussen metro station, take bus number 474 to Gustavsbergs Centrum. There you change to bus number 468 to Hålludden (just outside the main entrance). Please plan your trip in advance, so that you don’t have to wait a long time in Gustavsbergs Centrum for bus 468. When travelling from Artipelag with bus 468, the best place to switch to bus 474 towards Slussen is at the station Farstaviken. On weekdays you can take bus number 423 from Medborgarplatsen (Götgatan 59) to Hålluddens Trafikplats, which is a 1,5 km walk from the main entrance. From Slussen metro station, take bus number 474 to Värmdö Marknad which is a 3,5 km walk to the main entrance. When you get off the bus, take the road between COOP supermarket and INGO gas station and follow the signs towards Artipelag. Strömma Kanalbolaget runs boat tours during the summer to Artipelag from Stockholm. For guests with private boat we have a guest marina free of charge. The position is N 59° 18´ 4″, O 18° 20´ 7″. To go by car from central Stockholm takes about 20 minutes. Drive route 222 towards Gustavsberg and follow the signs. After the exit at Trafikplats Hålludden, the road becoms more narrow – please observe the speed limit 30 km per hour. Drive road 222, turn off towards Värmdö Marknad and keep to the right on Ingarövägen road. At the roundabout by COOP, turn left and follow the signs. Arriving from Gustavsberg turn right in the roundabout by COOP and follow the signs. Artipelag has a total of 350 parking spaces on four parking lots. Our parking machines only accepts credit cards – not cash. Artipelag use a system called Easy Park and we recommend you to download Easy Park’s app at App Store (iPhone) or Google Play (Android). Parking lot Tony (closest to Artipelag) 8702, parking fee SEK 20 per hour. Parking lot Josefin (the middle parking) 8701, parking fee SEK 35 per day. Parking lot Lillemor and Björn (the big parking lots at the entrance) 8700, parking fee SEK 35 per day. Fixed prices with Värmdö Taxi to and from Artipelag. Book a taxi by calling +46 8-570 357 00 and report “fixed price”. Price examples to/from Värmdö Marknad one way trip SEK 110, to/from Slussen one way trip SEK 455. Read more about practical information concerning parking, accessability, service and families with children.